Thirteenth Amendment to the U.S. Constitution, which abolished slavery. In order for a state to be readmitted to the Union following the Civil War, President Andrew Johnson required states to approve the amendment. Ten days following North Carolina’s vote the requisite three-quarters of the states had approved its ratification and thus it became law. This action by the legislature in 1865 actually came almost three years after the Emancipation Proclamation, which outlawed slavery in the southern states. Following the passage of the Thirteenth Amendment, the freedmen’s convention met a few blocks northwest of the N.C. State Capitol. That assembly was the first effort by the state’s African Americans to press for full political rights. 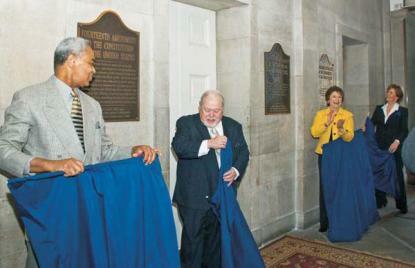 On December 6, 2010, officials of the North Carolina Office of Archives and History, and others met to dedicate and unveil four plaques commemorating the extension of civic and voting rights. In addition to one focusing on the 13th Amendment, the others so remembered were the 14thAmendment (granting rights to all citizens), the 15th Amendment (extending voting rights to new citizens) and the 19th Amendment (extending voting rights to women).